Do you remember the 1990’s sitcom Home Improvement? If you’re unfamiliar with it, it centers around accident-prone TV show host Tim “The Tool Man” Taylor, his wife Jill, and their three boys. The thing that stands out to me the most about this show is how much “The Tool Man” loved tools. We’re talking way past borderline obsession. The thing is, I love tools too. When I need to hang a picture, I appreciate a good hammer. Or, when it comes time to refinish an old wooden yard-sale bookshelf, I’ve discovered the electric sander proves invaluable. Literal home improvement isn’t the only place I value tools, though. I also appreciate them when it comes to my marriage. These tools aren’t fashioned from aluminum or wood or durable plastic. Rather, they’re practical ideas and time-tested concepts that I reach for to help build up my marriage. Here are five of my husband Ted and my favorite marriage-building, “team us”-strengthening tools and tips on how you can use them too. Make an old-fashioned paper and pen list of what you value in marriage. Then look for creative ways you can develop and practice those qualities regularly and consistently. This is a tool I encourage you to use at least once or twice a year. Because here’s the thing: no individual or relationship is static. You and your spouse will change. The question is: Will you choose to change together, developing your storyline together through chapter after chapter of plot twists? Getting on the same page … literally helps you do this. Sandwich constructive criticism for your spouse between genuine affirmation. I don’t know about you and your spouse, but Ted and I both swallow criticism better when we know that the other also recognizes and appreciates what we’re doing well too. A communication sandwich allows you to share what you’d like to see changed in a way that doesn’t put your spouse on the defensive. You can find an example of it here. Instead of having a knee-jerk reaction to something your spouse does, take a moment to weigh their motives and assume the best. After you’ve taken the time to do this, be direct with your spouse. Ask what fueled the actions or words. Then be sure to listen carefully and ask questions if something isn’t clear. When you do, be careful not to put them on the defensive. You will get a lot further in your conversation if your spouse feels like you’re genuinely trying to understand their driving motivation and really trying to assume the best. If you’re having trouble resolving an argument, take a break and give yourself some space to individually calm down and process. Then come back and work through the conflict. Cooler heads prevail. To use this tool, tell your spouse, “I need some time by myself to think about this. Let’s take a break and give each other a little room. After that, let’s continue this discussion.” Just be careful not to use The Break Room as an excuse to avoid dealing with an issue. When you use The Break Room in marriage, it should always be with the full intention of resolving conflict in a way that benefits the long-term health of your relationship. If you want to feel more connected on a daily basis, make shared activities a priority. Be intentional to carve out time each day to do something with each other. Maybe you have coffee and devotions together in the morning. Perhaps it’s hitting the gym together or talking over dinner. Make a plan and start putting it into action this week. And, if you find that the shared activity you decide on doesn’t work after all, pick something else and give it another try. There you have it. 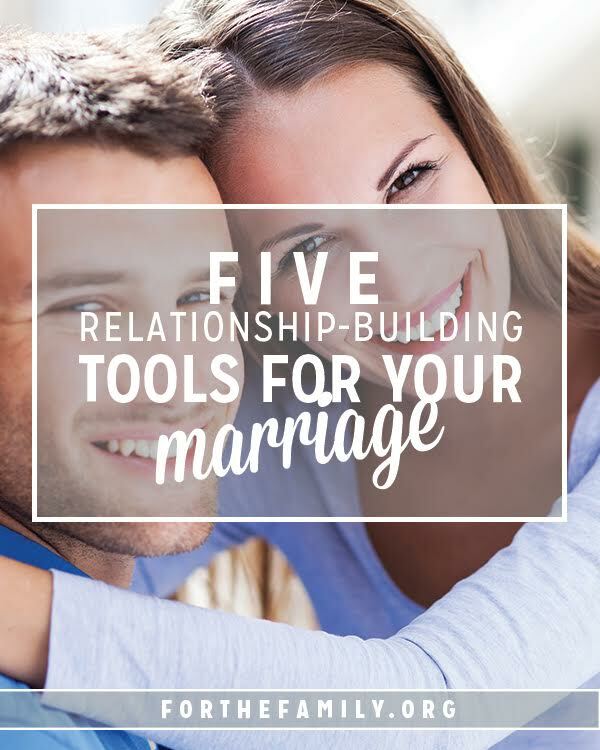 Five of my favorite marriage tools (which you can read more about here). Ted and I love them, and get good use out of them. They may be a good fit in your relational toolbox as well.